I’ll tell you what we saw, ratings gold! Go out and buy a hat, then get ready to hold the f**k onto it, because this is the next big thing. Maybe you noticed these commercials during tonight’s episode of Lost. ABC is doing some early promotion for a series that it hasn’t officially announced yet. 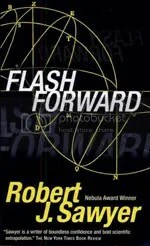 It’s called Flash Forward, and is based on the novel of the same name by Robert J. Sawyer. Let’s check out zap2it for more info! The show is based on Robert J. Sawyer’s novel and follows the fallout from a cataclysm in which the world’s entire population blacks out for just over two minutes. In addition to dealing with the chaos that ensues when everyone wakes up — everything from car crashes to people walking off rooftops — people soon come to realize that they all had a vision of their futures. The network says that those investigating the event will have only “a huge mosaic of people’s flash forwards” to go on. ABC has already set up a website you might want to check out. It’s sure to be all the rage at your office’s water cooler in the coming weeks, with everybody talking about what they saw and such. Check out Wikipedia for more on the book.